Anda Volley burst onto the scene last year with her sensational debut LP Inside the Machine. While her debut was a truly great album it is completely dwarfed next to this her follow up release which sees her take absolutely everything to a not just a new level but a whole new plane of existance! As I go through the songs I’m going to mention a shopping list of artists, but the thing is the music here manages to pick out the best bits of so many of the great experimental alternative artists of the past. At the same time these elements are all melded together to create something completely new, different, and above all exciting. On top of this Anda’s vocals work as the biggest driver in the sound, moving effortlessly from timid and vulnerable sounds to powerful blasts, with every slighy itch of emotion being firmly felt! ‘Are you armed’ opens the album with all the critters and creatures that go bump in the night, along with the night itself. The experimental sounds paint an epic and vivid dreamy soundscape that picks you up and carried you off to a far away land. ‘Fruitfly’ is a groovy yet chilling trip-hop tune in the vein of Massive Attack of Tricky. The trippy scratchy beats provide a hypnotic atmosphere that draws you in. Anda’s dark and powerful vocals paired with Andrew Scandal’s calm yet menacing delivery create a chilling, moving experience. ‘Blacklight Vegas’ has a subtle unnerving backdrop that is forced home courtesy of Anda’s sharp Beth Gibbons-esq delivery. Anda uses various vocal effects brilliantly to create a rough surface. ‘Instead I drunk and listened to Jimi Hendrix’ sounds like the dark side of Veruka Salt. Anda ranged her vocals from cold and breathy to harsh and concise. The dark and confronting lyrics are delivered almost sarcastically, with a deep sense of wit and vengefulness. ‘Released in your name’ is a sobering folk style tune. The strings provide a rich yet melancholic imagery, that drags you along yet makes you not want to let go. ‘Sometimes I read the ocean’ brings in a kind of new-age spacey sound, somewhat reminiscent of Cocteau Twins. The song brings in some curious electronic vibes that sound like they were pulled straight out of the eighties, yet in a weird kind of way they work in a way that makes it fresh and new. The echoing and deep vocals work as the glue for all the strange elements to fit together as if they were always meant to. ‘In our hearts’ is quite simply beauty in audio form. It’s soft, yet powerful, and amazingly moving! ‘Entwined Legand’ has a dark early Cure feel to it. The slow echoey Robert Smith-esq guitar brings out a morbid and bleak atmosphere that is further emphasised by the faint, vulnerable vocals. The album closes with the stripped back Ladders. The simple arrangement allows Anda’s vocals to be completely stripped bare, showing all manner of agony, emotion, and utter beauty. This is one of those albums that is really hard to do justice to with words alone. 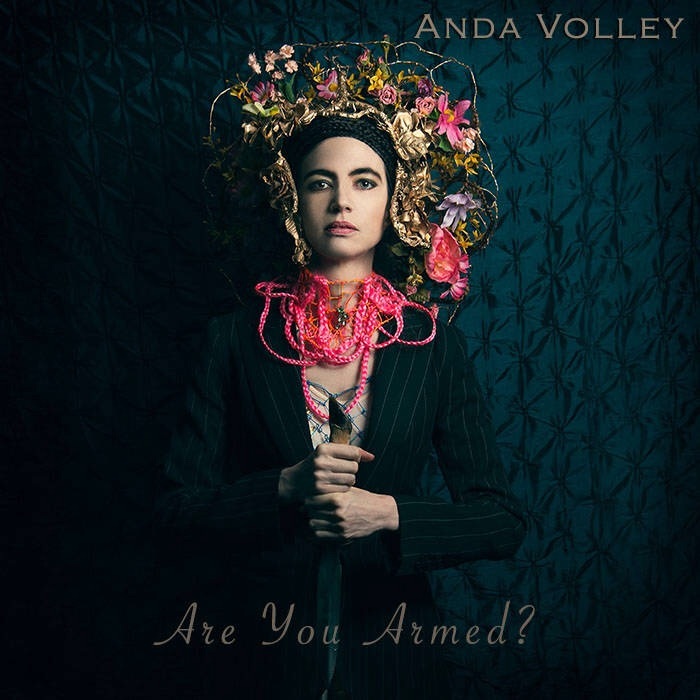 Anda Volley has put out some truly amazing sounds that can touch your heart and blow your mind at the same time. It’s edgy, it’s experimental, it’s moving, really, it’s everything! Check out Anda Volley’s website to find out more!